The Great War which scarred Serin pitted mage against mage, and resulted in much bloodshed and weakening of the arcane. After the war was burned out, and the weakened magi retreated to rest, Denadlyr stepped into their council to punish their foolishness, for his gift was intended to unify, to enrich and amuse, and for defence, not to harm, maim and kill. He split their guild into two new halls, and cast out the ones that disgusted him. Of the two new guildhalls, one was granted the ability to channel the sphere of elemental magic, the most volatile of the arcane. Known as the invokers, for their ability to invoke the elements, these magi learn to produce streams of damaging elemental magic, ranging from flame arrows to storms of ice. They also may manipulate and create matter, making swarms of meteors and imbueing weaponry with magical enhancements. They are also the pioneers of the famed sanctuary spell, one of the many kinds of protective shields an invoker learns to invoke. At their peak, an invoker learns to tap into the arcane, creating a vast beam of light capable of devastating anything in its path. An invoker is able to specialize in an element. This changes their abilities somewhat. Human invoker has a compounded experience cost of 0. Elf invoker has a compounded experience cost of 500. Drow invoker has a compounded experience cost of 500. Gnome invoker has a compounded experience cost of 200. Avian invoker has a compounded experience cost of 350. Quasit invoker has a compounded experience cost of 500. Strength 19 Lifeblood. Infravision. Resist Charm. Intelligence 22 Elemental Affinity. Improved Learning. Half-elf invoker has a compounded experience cost of 250. Use fly scrolls and protective shield to prevent your invoker being pinned down with bash and trip, unable to cast his spells. 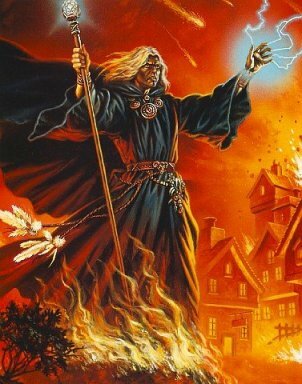 Dispel magic removes the positive spells from your enemy, leaving him wide open to a devastating hellstream. Enchant weapon is a great way to make money and buy friends. Focus on improving HEALTH and SAVE VS MENTAL to protect your invoker. His damage and defence comes mostly from spells, not his weapons.